He was born and raised in Danbury. A basketball lover at first, in November 2015, his life took a turn that not only allowed him to embrace his father’s professional career but also revealed a natu-ral ability enhanced by his faith in God and love for his family. Fernely Feliz, Jr., 20, who grew up watching his father Fernely Feliz box professionally as a heav-yweight, never really considered boxing one of his sports choices. “Actually, in the beginning, I didn’t really care too much about boxing… Seeing how hard my father worked just motivated me. My dad is my idol,” shares Fernely, Jr.
Around 2011, Fernely, Jr. met A.J. Galante, a Danburian who in that year became one of the youngest licensed professional boxing managers in the sport. 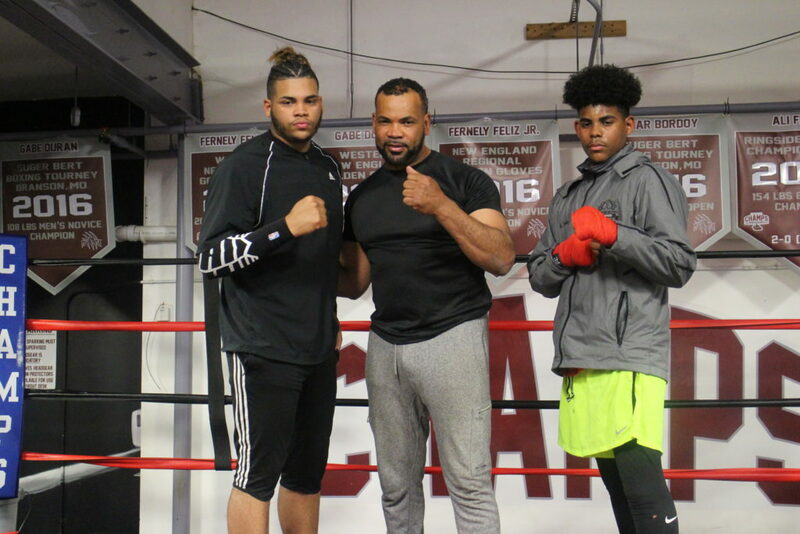 Inspired by Fernely, Sr.’s dream to open a boxing gym in Danbury, they became partners and cre-ated Champs Boxing Club & Fitness, where Fernely, Jr. started his training under their guidance. From Missouri to Massachusetts and beyond, Fernely, Jr. holds an impressive undefeated box-ing record. “I have fought ten fights with no losses. Every fight was basically in a big tourna-ment. I only had one fight that wasn’t in a tournament. I fought good guys, and just came out on top,” he said. And being on the top is what qualified him to become part of the national team for the National Golden Gloves tournament in Lafayette, Louisiana from May 1-6. As his son’s head coach, Fernely, Sr. is grateful for the opportunity to work with Jr. and have a partner like A.J. to help him out as a manager. “He won three in a row [at the National Golden Gloves] and went to fight in the semi-finals. We fell short, lost in the finals. It was an amazing tournament and such a grind. We just came up one win short… we will be back!” explained A.J. with pride about Fernely, Jr’s performance. Nonetheless, A.J. is not the only one on the fan’s bench seat. Iliana Feliz, 46, is the biggest fighter of them all. With a husband who has been boxing for over 23 years, now, she is going through the same emotions with both Fernely, Jr. and his brother, Ali, who decided to step into the squared circle right after his older brother started. Helping each other up is the spirit and the core mission of Champs. “This is a different type of gym. And it’s really home for a lot of these kids. They take care of it; they take pride in it,” ex-plained A.J., mentioning the work they do there with the Youth Fighting Forward, a non-profit organization. “It’s never been about the money. I think we’re going to build something here that the communi-ty’s going to be proud of… Danbury is going to be proud of,” he concluded. Located at 128 East Liberty Street, Danbury, Connecticut, this 3,000-square foot facility is the city’s only exclusive boxing gym. For more information, please visit http://www.champsboxingclub.org. Youth Fighting Forward is a non-profit organization dedicated to “Creating Champions In-side and Outside the Ring.” Its mission is to engage children of all backgrounds, whether they are affected by crime, poverty or low self-esteem. Along with mentoring and education, the organization uses boxing to help these young men and women develop life skills and a greater outlook on life, as well as improve their fitness, self-esteem and most importantly, their grades. For more information about Champs and the Youth Fighting Forward, please visit http://www.champsboxingclub.org.